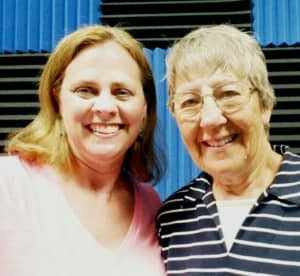 In this special Mother’s Day episode where we talk about money lessons from mom, I get to bring my own mom, Joyce Furubotten, to the podcast room. My mom, born during the depression and raised in a large farm family, has lived a self-described life of financial frugality but one rich in family, travel and “yard sale-ing”. Is that even a word? In our house, you better believe it is. Or JC Yardsale, when asked where something came from…insider stuff. You won’t believe how cheap both in and out of state tuition was at South Dakota State College, now called SDSU, was in the 1950s, where she met my dad. Wow, those were the days! My mom tells about the different things she and my dad did to raise 3 kids on one income. Learn 7 things the Furubotten family did to help make it. Which of these tips can you put to use in your own life? She and my dad even set me up with a stockbroker about the time I was in college. But guess what I did with that money (and didn’t tell my parents)! On this Mother’s Day, talk to your mom and find out about her money memories. It’s a fun trip down memory lane and it might explain a lot about your own money personality. Not only is today Mother’s Day, but next month my mom has a milestone birthday when she turns 80! Thanks, mom! Prior podcast EP. 5 – DREAMAHEAD AND GET READY TO PAY FOR COLLEGE.